We’ve all been in that spot. Where we get a “hankering” for something from our favorite restaurant, but our favorite restaurant is no where to be found. (My fellow country-living, middle-of-nowhere, people will especially understand the struggle.) There is something about that perfect breadstick and salad combo at Olive Garden that is hard to beat. But when you live over an hour away from one of your favorite Italian restaurants, what’s a girl to do when she gets a craving? 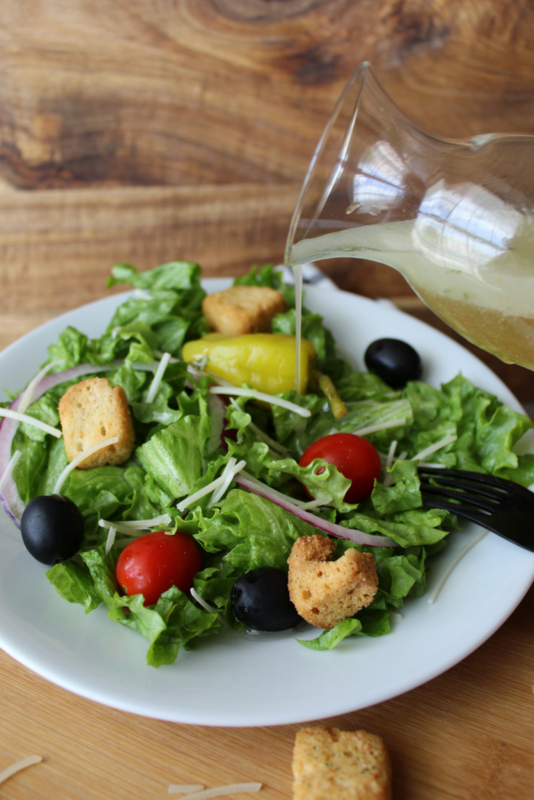 Raid the pantry and make your own Copycat Olive Garden Salad Dressing of course! 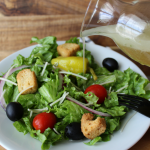 This is a quick throw together Italian dressing that is great to use in a pinch or to impress dinner guests. 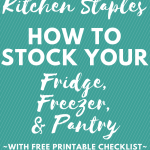 And like I mentioned above, most likely all of the main ingredients are in your pantry already. Whisk together or shake it up in a mason jar with lid. My biggest piece of advice is to serve immediately as the liquids will start to separate due to their natural densities. Hey! I did learn something in all those years of science classes! 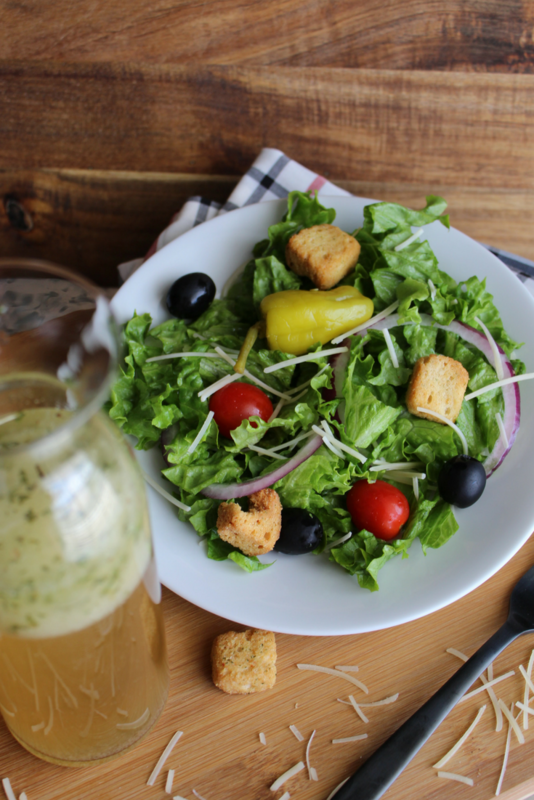 Pour over a simple bed of lettuce and make it a true Olive Garden salad with Parmesan cheese, sliced red onions, tomatoes, black olives, pepperoncinis, and croutons. Then serve along your favorite pasta or Italian dish and dinner is served! 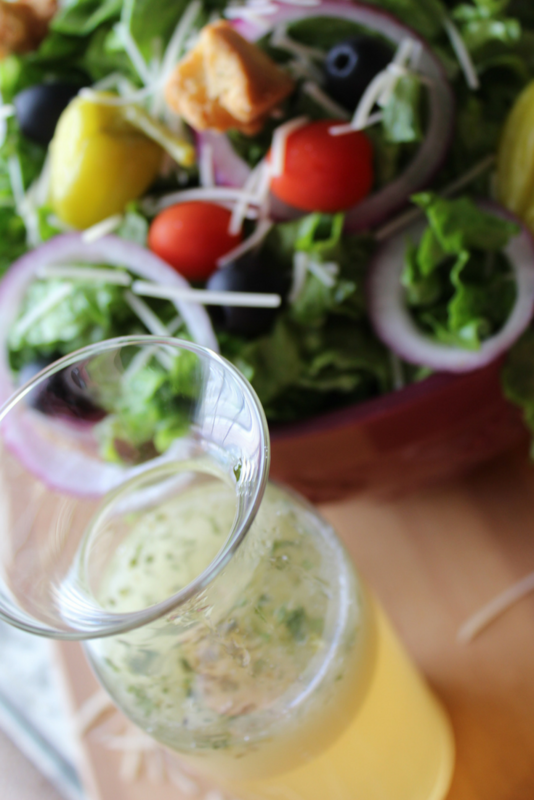 Serve immediately (otherwise the liquids start to separate) over your favorite salad. In true Olive Garden fashion include Parmesan cheese, sliced red onions, black olives, tomatoes, pepperoncinis, and croutons.